A seasonal, healthy recipe suggested by USTA Middle States Adult Competition Coordinator, Mary Wurtz. Mary holds a culinary degree from The Restaurant School of Philadelphia. 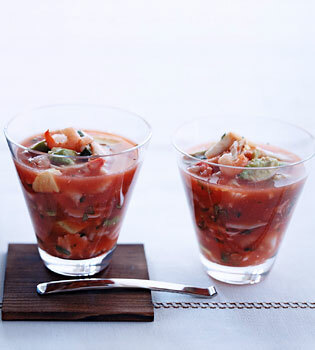 Stir together Clamato juice, ketchup, lime juice, hot sauce, salt, onion, and cilantro in a large bowl, then gently stir in avocado, crabmeat, and shrimp. Spoon into 6- or 8-ounce glasses or cups.